Many Americans don't drink as much water as they should (11 to 16 cups daily, suggests the Institute of Medicine). If plain water bores you, try lemon water instead to make meeting daily fluid requirements more bearable. A simple recipe with just two ingredients, lemon water may provide you with some surprising health benefits. There's no specific guidelines stating how much lemon water you should drink, but one or two glasses per day should do the trick. It doesn't matter what temperature lemon water is, as you'll reap health benefits either way. Cleveland Clinic suggests squeezing 1/2 lemon into a glass of water and including lemon zest peel in your mixture to maximize nutritional benefits. Low-calorie lemon water helps fills you up, which is beneficial for healthy weight management. Two tablespoons of lemon juice contain just 7 calories. A 2008 study published in the Journal of Clinical Biochemistry and Nutrition found polyphenols in lemon decreased weight gain and fat accumulation in mice fed high-fat, high-calorie diets. A 2015 study in Nutrition and Research showed drinking lemon water as part of a low-calorie diet enhanced weight and fat loss. Finally, a 2013 study reports drinking two cups of water before meals aids in weight loss in overweight and obese adults. So, drink lemon water for healthy weight management, especially if you have pounds to lose. Healing Place reports that if you're like over two-thirds of Americans, you're not drinking as many fluids as you should be and suggests drinking 8 to 10 cups of water daily. Cleveland Clinic says drinking lemon water regularly helps you stay hydrated, and urine that is almost clear (not yellow) is a sign of good hydration. Citrus fruits seem to enhance digestion, according to one 2012 study. Cleveland Clinic says lemon water aids in digestion because it's acidic, and acid helps break down food. Improved digestion is especially beneficial for older adults who may experience decreases in stomach acid associated with age. Believe it or not, drinking lemon water may lower your risk for certain types of cancer. For example, a 2015 study published in the British Journal of Nutrition found consuming citrus fruit lowered your risk of digestive tract and larynx cancers. The Office of Dietary Supplements confirms that vitamin C found in lemon juice could help prevent certain cancers. Vitamin C in lemon juice is a powerful anti-oxidant, which can help you maintain a youthful look. This essential nutrient helps prevent oxidative damage associated with aging, according to the University of Maryland Medical Center. One fourth cup of lemon juice provides 24 milligrams of vitamin C, which puts you well on your way to meeting daily vitamin C requirements. A 2012 review in Dermatoendocrinology found that ingesting vitamin C and other antioxidants (like vitamin E) helps reduce skin wrinkles caused by ultraviolet radiation. Because of lemon water's vitamin C content, it may help reduce your chance of developing painful gallstones, according to a 2009 study in BMC Gastroenterology. Researchers who conducted this study found that higher vitamin C intakes helped reduce the presence of gallstones from 8 percent to 5 percent. Iron supplements may also help prevent gallstone formation, according to one one 2009 study, and vitamin C enhances iron absorption. Lemon water may boost immunity, heal wounds, and even help treat viruses when taken in large doses because of the vitamin C, according to the University of Maryland Medical Center. And if you do get sick, Mayo Clinic suggests drinking warm lemon water with honey to prevent dehydration and loosen congestion. Another benefit of lemon water is it gives you a boost of potassium, which is an important essential nutrient -- and, it's an electrolyte. This means lemon water (especially when you add a dash of salt to it) helps replenish lost electrolytes after strenuous workouts or excessive sweating in the heat. Just two tablespoons of lemon juice provides you with about 30 milligrams of potassium. 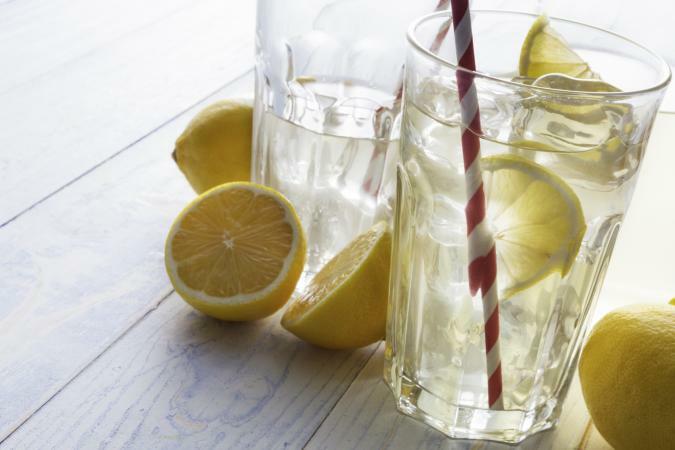 Believe it or not, lemon water could lower your risk for developing heart disease. The Office of Dietary Supplements reports that although more research is needed, vitamin C in lemon juice may help prevent heart disease and other diseases oxidative stress may cause. The University of Maryland Medical Center confirms that vitamin C prevents buildup and hardening of arteries and lowers blood pressure, and that getting too little vitamin C boosts your odds of heaving a stroke or heart attack. If you have diabetes or are at risk of developing diabetes, lemon water may help. The 2008 study in the Journal of Clinical Biochemistry and Nutrition found that polyphenols in lemons help control high blood sugar and decrease insulin resistance. The University of Maryland Medical Center says vitamin C found in lemon juice may help lower blood sugar in people with diabetes. With all the potential health benefits lemon water provides, why not include this natural remedy in your daily routine? If you're concerned about negative effects of lemon juice on tooth enamel, Cleveland Clinic says since you're diluting it in water you shouldn't have to worry. But if lemon water isn't your thing, drink plain or detox water instead plus a variety of fruits (including citrus fruits) and vegetables to reap the same health benefits.